MatraSport Forum > Each model > Bagheera > My projects. Well now i have bought me a second Baghera and i was thinking of starting a thread here where i putting in photos and progress aswell as my setbacks , wich i so well know will come. This car is so much more documented then my first (the white one) Baghera, this car is sold in Sweden and are one of the few that was sold here and it has specific Swedish equipment such as headlight cleaners and such. One other thing is that i am the 3 private owner since the car was new and i have all papers and books to the car since it was new, even the cards the factory used to know wich things they should put into the car when they builded it, and of course the invoice from france where the price is stated. The black box you see on the picks are the washerfluid tank for the Swedish market. Well done for rescuing another Bagheera! Your white one is stunning. Good luck with your projekt. Hope to see it on the road someday. 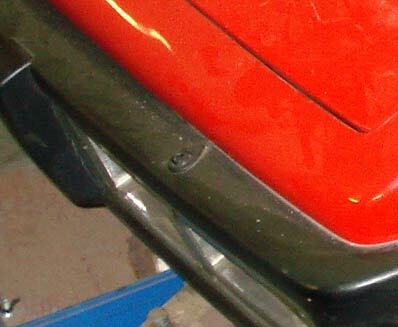 The picture of the frontbumper, shows a weird "bump" right next to the Bagheera-sign?? ?.....I have never seen that before, that can not be original?...It looks as if some kind of spotlights has been attached there? The picture of the frontbumper, shows a weird "bump" right next to the Bagheera-sign??? The first time I see this tank other than on drawings. It is also interresting to see the perforated card to establish the waranty. You need to imagine what were the computers in the early seventies. When I consulted the files (printed on large dot matrix printer) I was thinking that these data were re-encoded year later. No no. Matra was so modern that everything was managed on computers, from the start. Well as i can understand so was this bumps original for the Swedish market, we had it in our rules that every sold car needed these headlampwashers to be approved for road use, it has changed now but i think it's fun beacuse it's a part of the car and it's history, it's almost unique in this condition, i havent ever seen a Baghera with this things, and i will probably never do again. And it's original;) i have checked it and it's not made after the bumper was moulded. And some more , and here is a pic of my Alfa 164 also, it's funny every time to see the difference in size beetwen them . Thanks all, i am really thankful for all input and comments:). It is very nice to know that there are others with the same passion for this little "strange" car. Now i only have to sell my Alfa and my Alpina B6 so i have room in my garage to start with them:).